This website is dedicated to bring to the public all the information related to recovery. Its mission is that of transparency and access. The recovery involves a multitude of parties: Government ministries and agencies, international organizations, private companies, NGOs, and the public at-large. 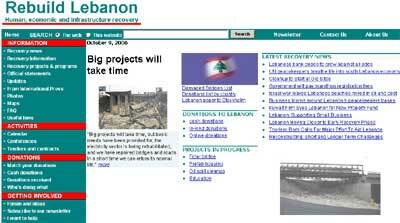 This website is a virtual portal for all the activities related to the recovery of the country, an information reference, and a link to all recovery stakeholders. This website contains news on recovery and associated events, details on received donations and its earmarking, tendering and contract awards, links to all stakeholders, and a medium to get involved.